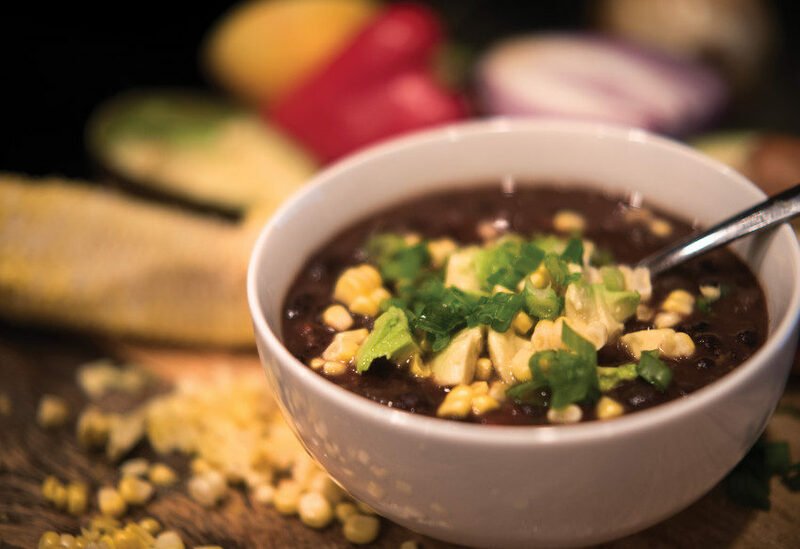 This is a super-velvety black bean soup that is made creamy by mashing some of the beans as the soup cooks. It has STELLAR nutrition facts – if you want to lose weight, increase your fiber intake! Also, it freezes beautifully, and tastes even more amazing after being frozen! Freezing instructions are below ? This is a nutritious & very filling take-to-work lunch, or a comforting dinner. For some reason I always crave this stuff after an evening workout….or when we have spent an evening in the cool outside playing. I created this recipe for Albertsons/Safeway. 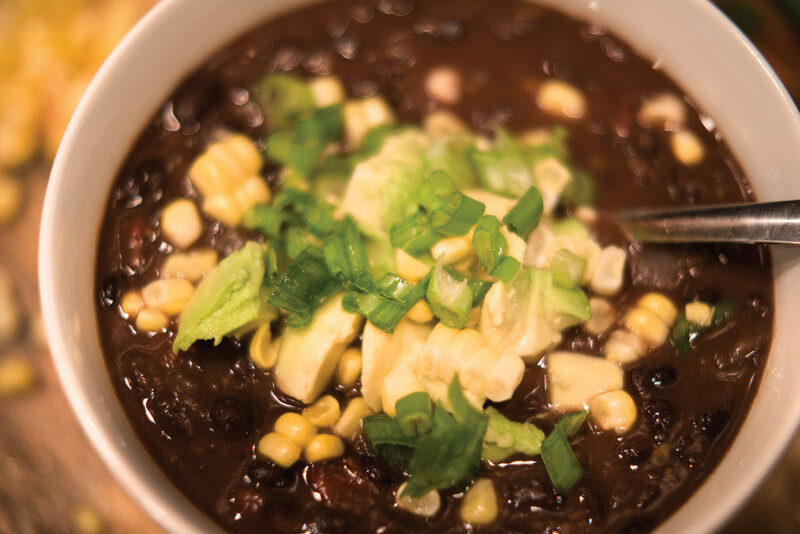 See here for another amazing recipe making homemade black beans in the crockpot! For me, cooler weather means I need big bowls of comforting things. With lemon zest for sunshine. 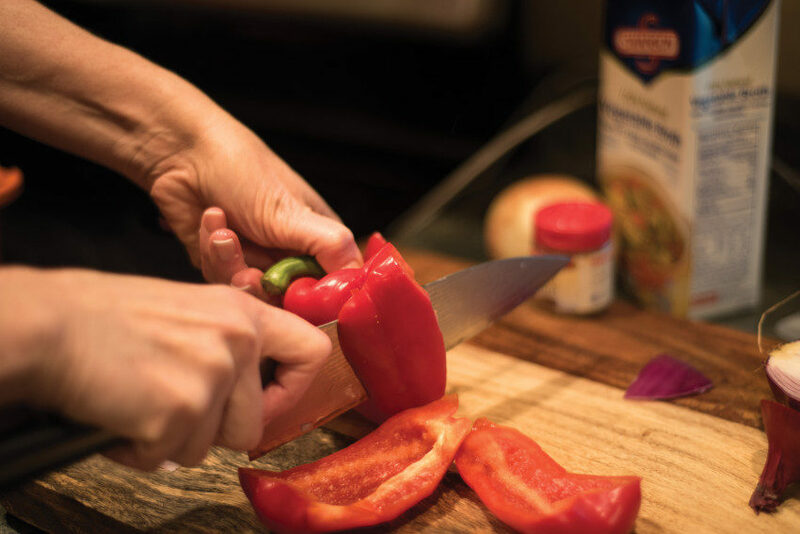 This recipe is deep in flavor, without being spicy….nor having cilantro. I have to admit this, cilantro is the only food I do not like! What I’ve found is people either love it or hate it. But hey, if you love cilantro, go ahead & add buckets to this soup. Roughly chop a red onion. Any onion will do, but a red onion gives the soup a slightly more zingy flavor. 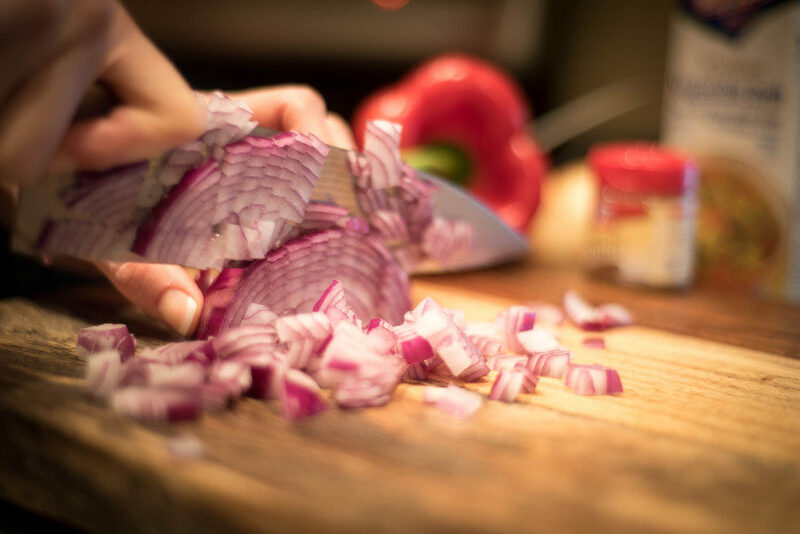 Onions have TONS of benefits for boosting the immune system and fighting off colds (just like their cousins, garlic;), so, as you’re chopping, think of this instead of how strong this onion smells! …it’s all about positive thinking. Next, can we talk bell peppers for a hot minute? 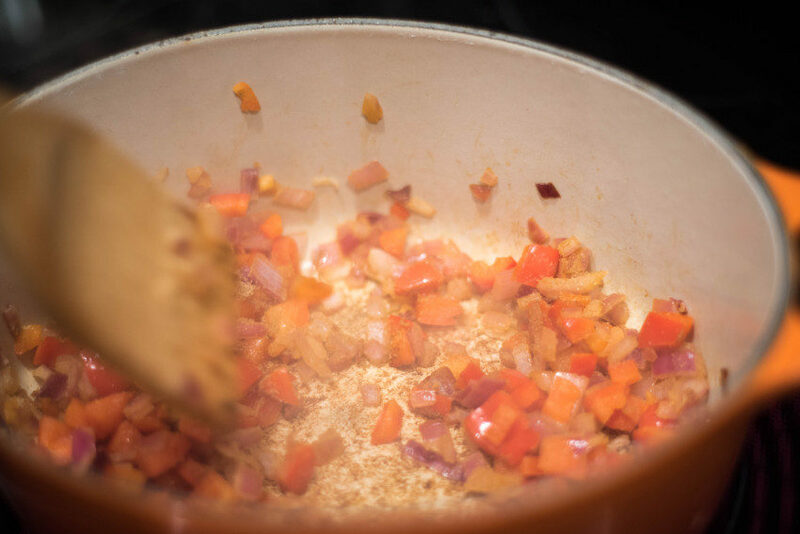 Sautéing a red bell pepper when you start a soup gives you miles of flavor-power. 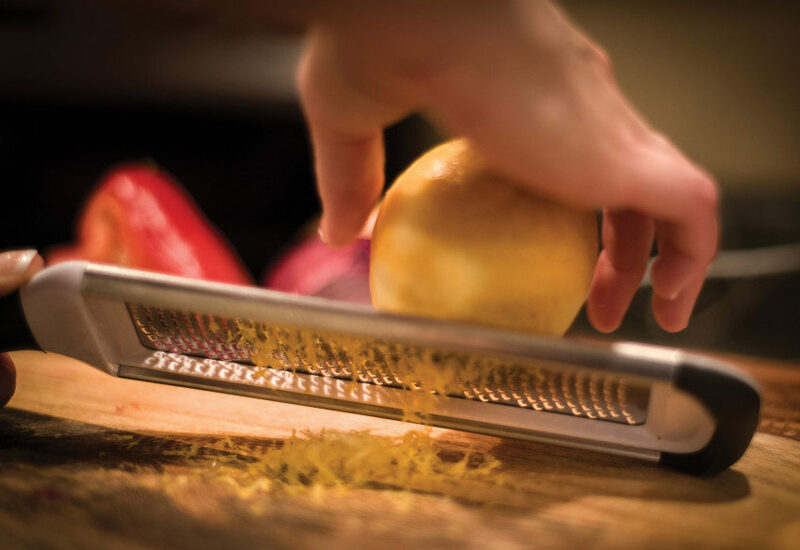 But, don’t make the chopping complicated. My favorite efficient way is to slice it wrinkle-to-wrinkle, that way I don’t leave any of the beautiful veggie behind, yet I don’t get the seeds in with the chopping. Then, put those “wrinkles” skin side down, slice and then dice. 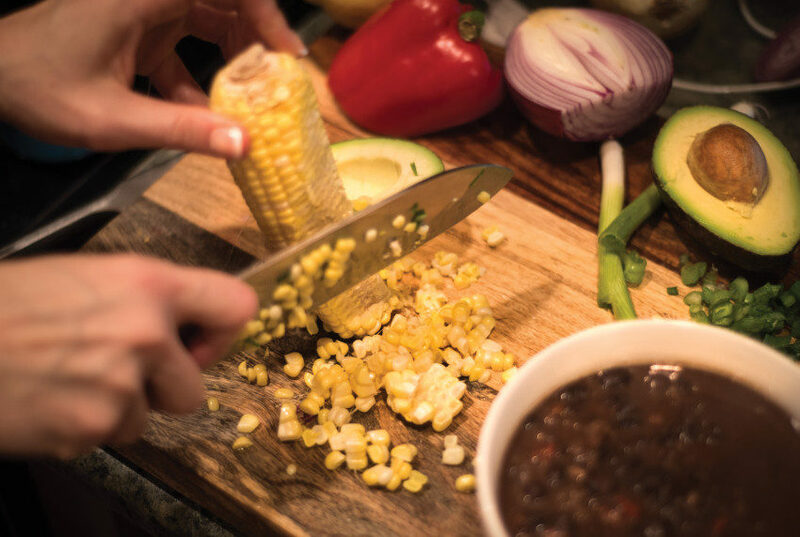 The most helpful thing I learned in cooking school was how to cut produce! 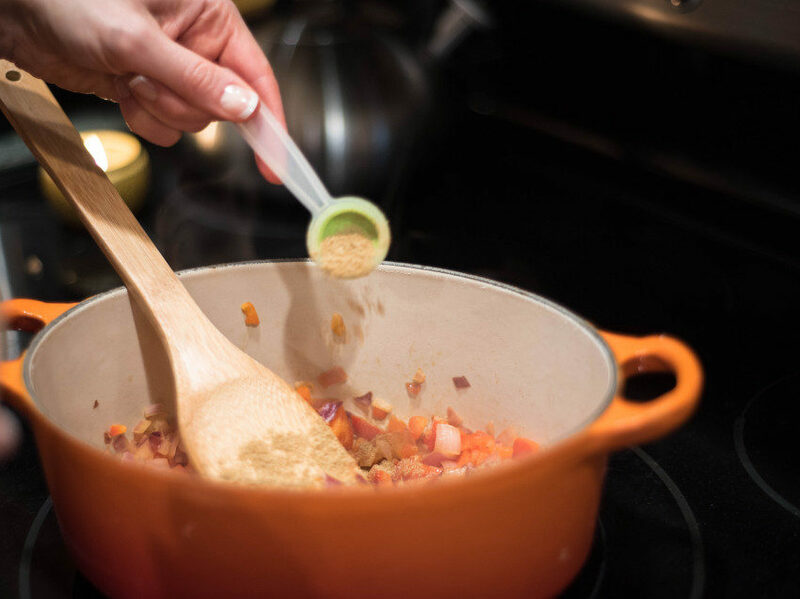 Now for our main seasoning star – 2 teaspoons ground cumin. Instead of adding it last, we are adding it first, so it can toast on the bottom of the pan as the onions & bell pepper finish sautéing. Each ingredient needs to shine here ? 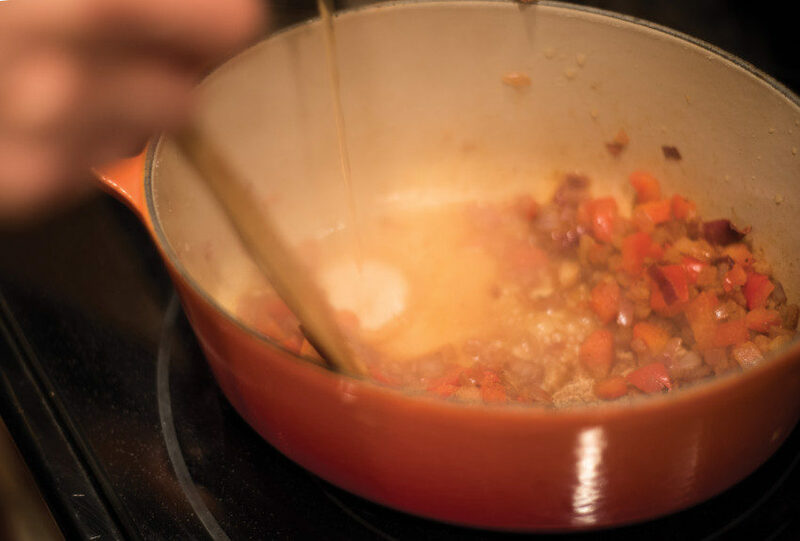 and be sure to scrape the bottom of the pan as you stir…all the brown bits on the bottom are flavor that will end up on the soup. And let soup simmer for 15 minutes or so. Longer wouldn’t hurt either! The secret to making this creamy? It’s not in adding anything unhealthful *fist bump*, it’s just by mashing the beans themselves! 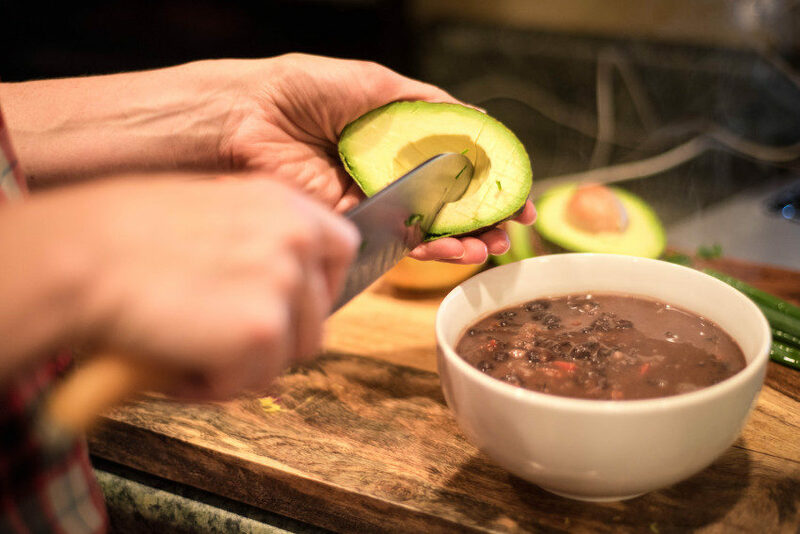 Use a good fork to mash about half of the black beans against the side of the pot. The last – and maybe most important – step? LEMON ZEST. It’s delicious. It gives this soup a little zing and makes it sing. I love it. Just about a teaspoon or so. Remember not to get any of that white part when zesting your lemon! ….only the yellow. I like to keep this vegan and top it with added veggies I have around (though avocado is technically a fruit). Avocado is filled with monounsaturated healthy fats (I call them MUFAS), that actually help you BURN fat. How kind of them! …and they taste amazing. 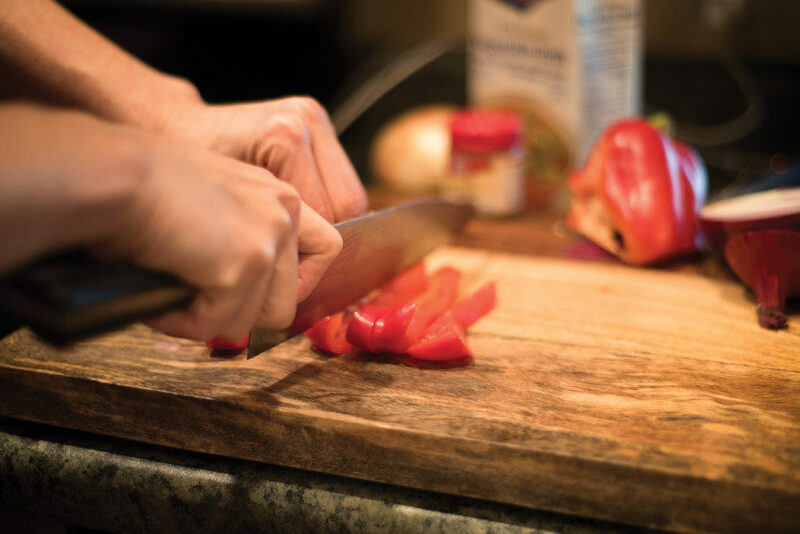 …then some chopped green onions and a good squeeze of that lemon we tested. Lemon has tons of disease-fighting powers, so it’s another plant great to get in during winter! 1. 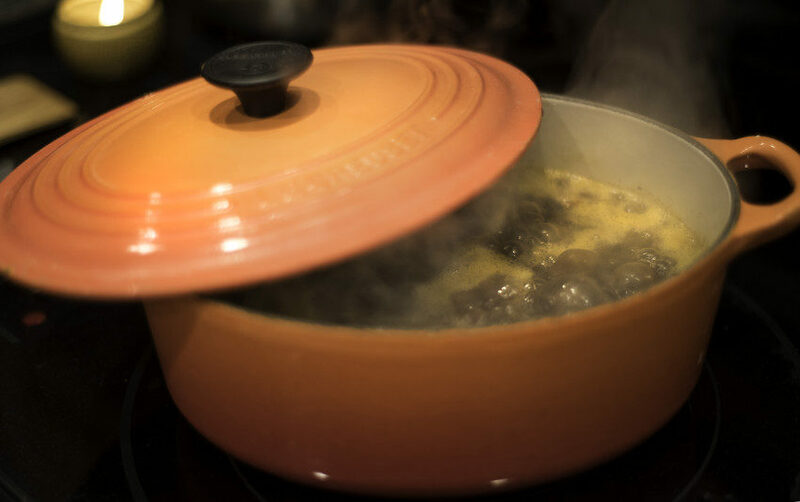 Heat a stock pot to medium and spray with nonstick cooking spray. Add onions and bell pepper, sautéing until translucent, about 5 minutes. 2. Add cumin and stir to let it toast on the bottom of the pan, just for about a minute. Pour in broth and stir, scrapping up the brown bits on the bottom of the pan. Then add beans. 3. 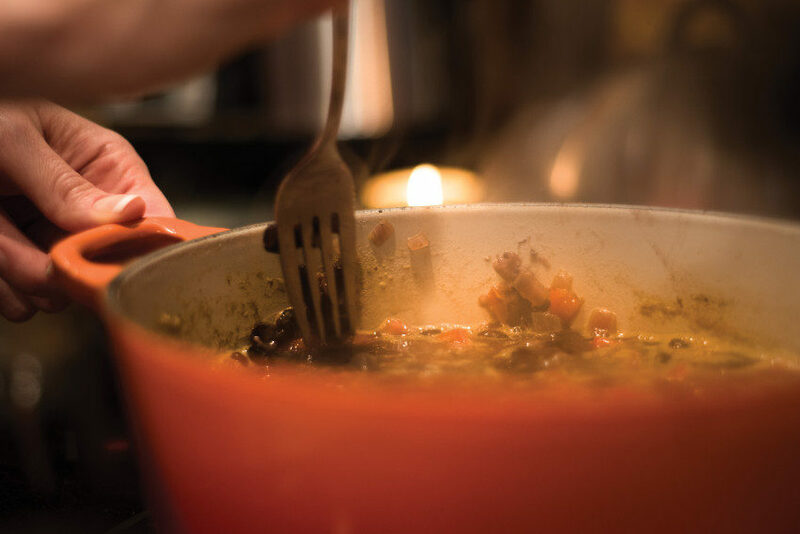 Bring soup to a simmer, letting simmer for 15 minutes. 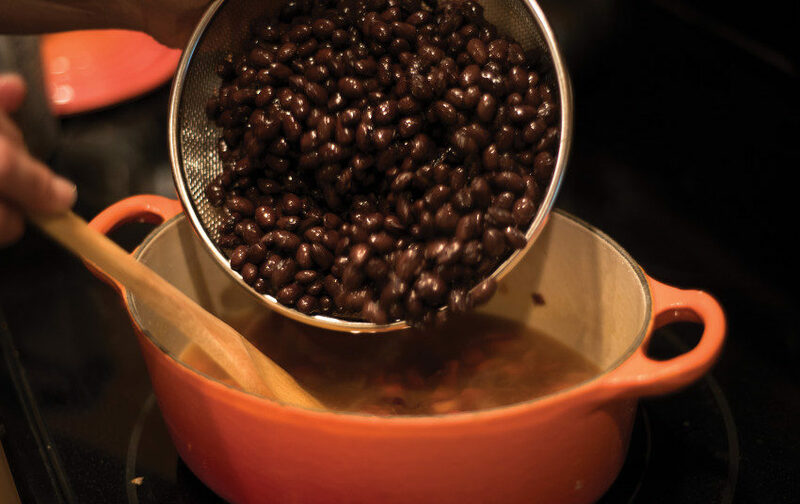 Stir occasionally, mashing about half of the beans by pressing them against the side of the pot with the back of a wooden spoon or fork. Soup should be creamy and thick, but still chunky. 4. Turn off heat and stir in lemon zest and squeeze of lemon juice. 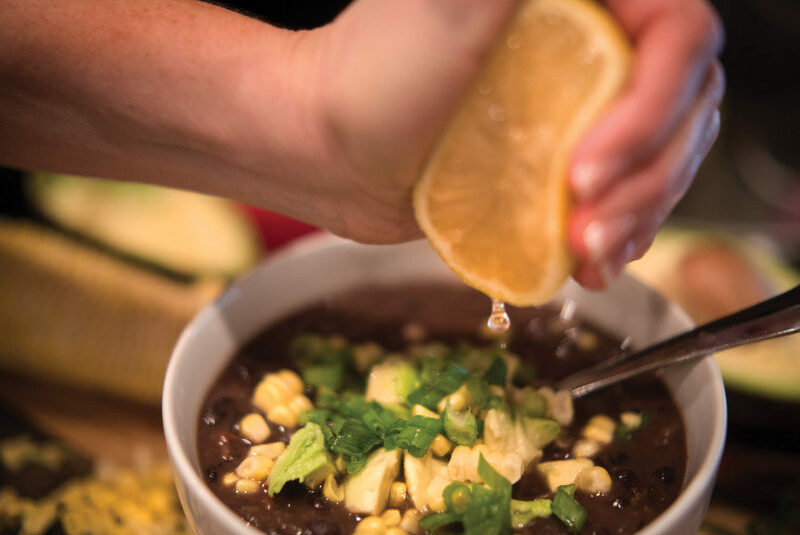 Top with scallions, avocado, and corn kernels. *Freezing instructions: cool soup completely. Put 2 cupfuls in a freezer-safe bag or container, write the date on it, and freeze flat. To reheat, run bag or container under hot water just to loosen, then heat it in a saucepan over medium heat.
? yummy ~ this is delicious!